Sudan's President Omar al-Bashir has declared a national state of emergency, dismissed the federal government and sacked all state governors. Mr Bashir made the announcement in a TV address to the nation, but later appointed members of the security forces as replacement governors. 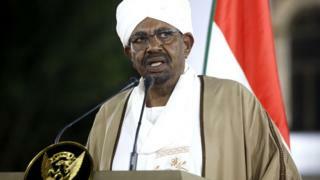 Earlier, Sudan's National Security and Intelligence Services (NISS) said that Mr Bashir would be stepping down. Mr Bashir has been the focus of anti-government protests in recent weeks. Protesters took to the streets after the announcement in the city of Omdurman, witnesses said, but were met with tear gas by police. What happens inside Sudan's secret detention centres? In the address, Mr Bashir asked parliament to postpone constitutional amendments that would allow him to run for another term. Mr Bashir also said the demonstrations were an attempt to destabilise the country. "I announce dissolving the government at the federal level and at the provincial levels." Hours after the announcement, Mr Bashir issued two presidential decrees appointing army and security officers to govern the country's 18 provinces. He also announced that five members of the outgoing cabinet, including the foreign, defence and justice ministers, would keep their jobs. The demonstrations started over cuts to bread and fuel subsidies in December but later morphed into anger at Mr Bashir's 30-year rule. More than 1,000 people are reported to have been detained since the protests began. Rights groups say more than 40 people have been killed in clashes with security forces. Protest organisers have vowed to continue demonstrating until Mr Bashir leaves his post, AFP news agency reported. Mr Bashir, 75, had initially struck a defiant tone after winning elections several times since coming to power in a coup in 1989.